For many early Portuguese immigrants to Hawaii, their main contact outside of the plantation was through the local Catholic Church. For many genealogists, church records may be the only way to identify links back to the “old country”. When researching, you must be aware of the many name variations or you may miss your ancestors. One problem exists with Catholic Church records–they’re written in Latin. Like most, my knowledge of Latin is limited to the study of word origins in a High School English class. However, it isn’t too difficult to pick out the important details within records. Knowledge of other church records can help with the translation. The problem is that the names have been latinized. This creates a challenge for researchers as they must now consider another form of your ancestor’s name when doing research. There seems to be disparity between which form of the name is used. Some records have the Latin form, some the Portuguese, and some a jumble of forms. The practice varies from church to church and from Priest to Priest. Those who used the Latin form usually only applied it to the bride and groom’s names. It is more predominant in pre-1900 records. It is interesting to note that these Latin variations made their way into the civil records. Since many of the first two generations came primarily as laborers, it is probably a good guess that they could not read or write. While I am unsure of the record filing process, my guess is that couple took their marriage certificate when they went to have the event record in the civil registers. Because of the language barriers throughout Hawaii, they would hand the certificate to the person recording records. This person then copied names exactly as they saw them. What difference was it to them if a person was Maria or Mariam, Jose or Hoses? Here are some examples of names found in church records. Spellings may vary from accepted forms. It is possible in some cases, the Priest was not writing the Latin form. He may have been trying to make sense of the Portuguese accent. 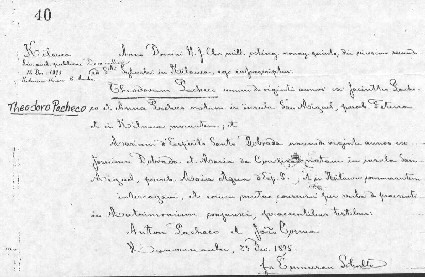 This is a snippet from a Latin church record from St. Sylvester’s Church, Kilauea Kauai, Hawaii. you can click on it to enlarge it. Yep, it’s all in Latin! I was not expecting to know Latin when I began working in Hawaii’s church records. I found a Latin language dictionary to be quite handy. I have the Cassell’s Latin and English Dictionary. There are many others to choose from. You can also find them online for free. Keep that dictionary handy if you’re working in Catholic Church records in Hawaii. You will need it!